Peace comes from within. Do not seek it without. 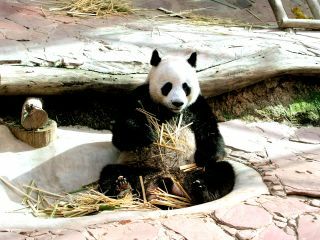 We were lucky to see this panda. His/her mate left just as we arrived and he quickly finished off his bamboo snack and ambled off after her. Had a bit of a row prior to entering. Everybody has to purchase special "Panda" tickets to get in and they wanted to charge the "Foreigner Price", approximately 10 times as much as the Thai price! A differential I flatly refuse to pay anywhere in the country. They eventually permitted me access as a Thai, but I had to pass a spoken Thai test before they would do so.